The company on Monday showed off an electric car prototype, based on the Tiida mid-size sedan. 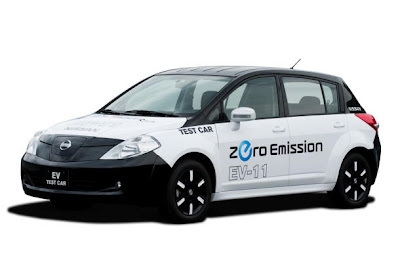 It said that an all-electric production car with a unique design will be unveiled on August 2 at its Yokohama, Japan headquarters and go on sale in 2010 in Japan and the U.S.
Nissan's EV prototype, an electric power train fitted onto a Tiida/Versa mid-size Versa sedan. Because of the limitations on driving range and the high cost of batteries, other automakers including Toyota and General have said they expect consumers will favor gasoline-electric cars.